Winnipeg will experience life-threatening temperatures this week as brutally cold Arctic air moves into the region. There isn’t a whole lot of setup to this story: in the wake of yesterday’s clipper system that moved through Saskatchewan, a huge surge of Arctic air will spread across the Prairies. Today will be a comparatively mild day with a high near -18°C. Skies will clear out bys late this afternoon, marking the arrival of the bitterly cold air. Temperatures will drop to a low near -35 tonight. Winds of 30 gusting 50 km/h will be in place for Winnipeg today, easing to 20 km/h overnight. That’s a stronger wind than normally seen in Winnipeg when this cold and will produce wind chill values in the -45 to -50 range. Tuesday and Wednesday will both bring daytime highs near -30°C for Winnipeg. Winds will increase into the 30 to 40 km/h range for Tuesday afternoon, producing wind chill values in the -45 to -50 range. The winds will then gradually diminish on Tuesday night as temperatures drop to a low near -38°C. Wind chill values will likely hover in the -45 to -50 range. Wednesday night will be marginally “warmer” with a low near -35°C. Temperatures will struggle to climb to -30°C in the Red River Valley on Tuesday. Needless to say, when daytime highs struggle to reach even -30°C, the cold presents a real threat to those unable to get inside. Consider donating to shelters to help those who are unable to escape the elements. Ensure that your car contains a winter survival kit if you’re travelling on area highways. Having one could mean the difference between inconvenience and serious harm if you end up stranded on the side of the road somewhere for some reason. 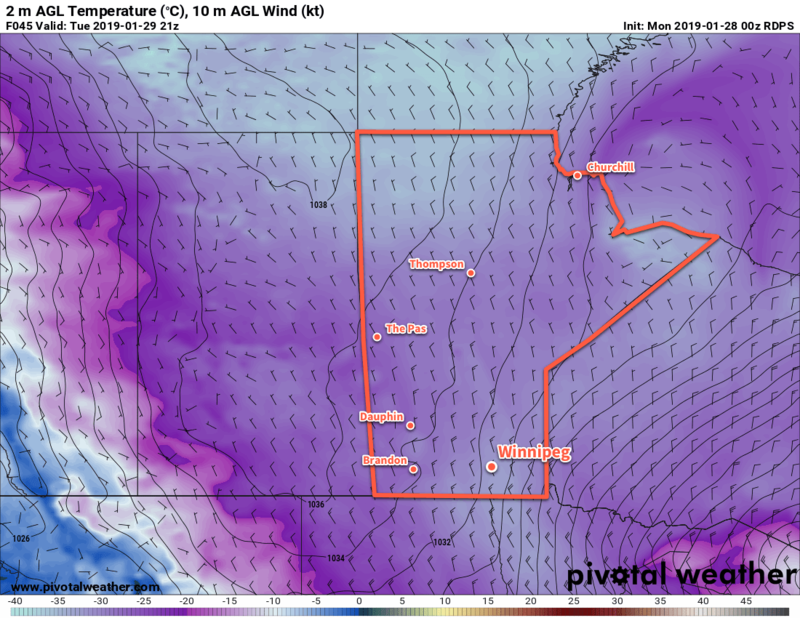 Winnipeg may challenge some records in the coming days. While we are unlikely to set record lows unless temperatures really drop on Tuesday night and end up in the -40s, the city may see some new record low maximum temperatures. The record low maximum for January 29th is -32.0°C set in 2004. The record low maximum for January 30th is -30.8°C, also set in 2004. Cloud cover and milder temperatures will begin working into the city through the remainder of the week. The city should see a daytime high in the -25 to -20°C range on Thursday followed by near-seasonal values on Friday. Some snow is possible to round out the work week and start the weekend. Winnipeg’s seasonal daytime high is currently -12°C while the seasonal overnight low is -22°C.